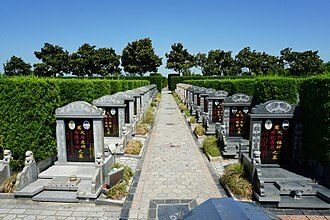 This article is about the ancient city. For the modern municipality, see Faistos. For other uses, see Phaistos (disambiguation). The state ruled from Knosses under a monarchy symbolized by "King Minos"
8,400 m2 (90,000 sq ft) for the palace. The city covered the hill and a few km into the valley below. Current interventions are tamped soil, stone walkways, hand rails, lightly roofed areas. More are planned in the interests of preservation and access. "Phaistos". Odysseus. Hellenic Ministry of Culture and Tourism. 2007. Phaistos (Greek: Φαιστός, pronounced [feˈstos]; Ancient Greek: Φαιστός, pronounced [pʰai̯stós]), also transliterated as Phaestos, Festos and Latin Phaestus, currently refers to a Bronze Age archaeological site at modern Phaistos, a municipality in south central Crete. Ancient Phaistos was located about 5.6 km (3.5 mi) east of the Mediterranean Sea and 62 km south of Heraklio, the second largest city of Minoan Crete. 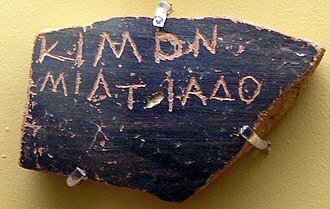 The name Phaistos survives from ancient Greek references to a city in Crete of that name at or near the current ruins. The name is substantiated by the coins of the classical city. 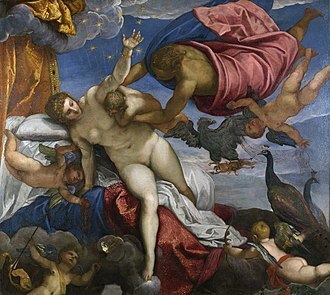 They display motifs such as Europa sitting on a bull, Talos with wings, Heracles without beard and being crowned, or Zeus in a form of a naked youth sitting on a tree. On either the obverse or the reverse the name of the city, or its abbreviation, is inscribed, such as ΦΑΙΣ or ΦΑΙΣΤΙ, for Phaistos or Phaistios ("Phaistian" adjective) written either right-to-left or left-to-right. These few dozen coins were acquired by collectors from uncontrolled contexts. They give no information on the location of Phaistos. 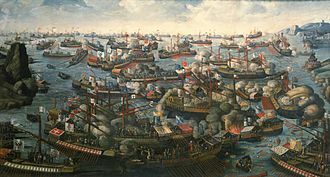 Of the three cities that were united under one metropolis by Minos, the third, which was Phaestus, was razed to the ground by the Gortynians; it is sixty stadia distant from Gortyn, twenty from the sea, and forty from the seaport Matalum; and the country is held by those who razed it. A village of 16 houses remained on the ridge, but the vestiges of fortification walls indicated a city had once existed there. A half-century later, on removing the houses, Federico Halbherr and his crew began to discover the remains of an extensive palace complex. As he had begun excavation before Evans at Knossos in 1900, he did not have the advantage of Arthur Evans' concepts of Minoan civilization nor the knowledge acquired after the decipherment of the Linear B syllabary by Michael Ventris. Excavation ended in 1904, to begin again after another half-century, in 1950. By this time it was understood that the palace had been constructed at the beginning of the Proto-Palace Period, along with all the others. After 1955 the place name, 𐀞𐀂𐀵, pa-i-to, interpreted as Phaistos (written in Mycenaean Greek), began to turn up in the Linear B tablets at Knossos, then under the Mycenaean Greeks. There was every reason to think that pa-i-to was located at Kastri. No Linear B has been found at Phaistos, and yet tradition and the Knossos tablets suggest that Phaistos was a dependency of Knossos. Moreover, only a few pieces of Linear A have been found. As Phaistos appears to have been an administrative center, the lack of records is paradoxical. However, the lack of an expected event is not an argument for any conclusion. There are many possible reasons for the deficit. Records may yet be found. In 1908, Pernier found the Phaistos disc at the basements of the northern group of the palace. 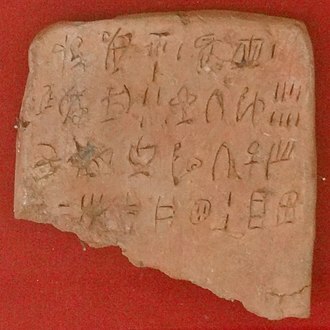 This artifact is a clay disk, dated to between 1950 BC and 1400 BC and impressed with a unique sophisticated hieroglyphic script. The tombs of the rulers of Phaistos were found in the cemetery that was discovered 20 minutes away from the palace remains. Phaistos was inhabited from about 4000 BC. A palace, dating from the Middle Bronze Age, was destroyed by an earthquake during the Late Bronze Age. Knossos along with other Minoan sites was destroyed at that time. The palace was rebuilt toward the end of the Late Bronze Age. The first palace was built about 2000 BC. This section is on a lower level than the west courtyard and has a nice facade with a plastic outer shape, a cobbled courtyard, and a tower ledge with a ramp, which leads up to a higher level. 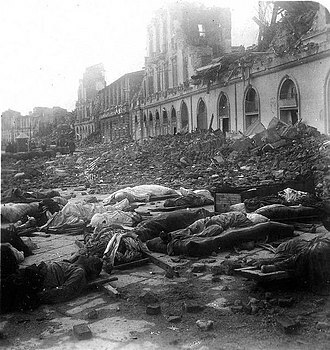 The old palace was destroyed three times in a time period of about three centuries. 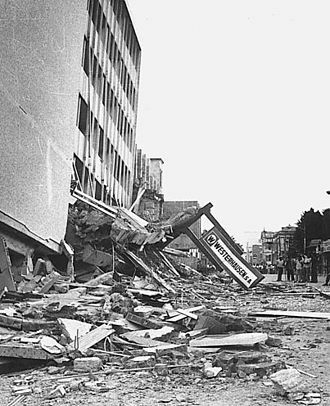 After the first and second disaster, reconstruction and repairs were made, so there are distinguished three construction phases. 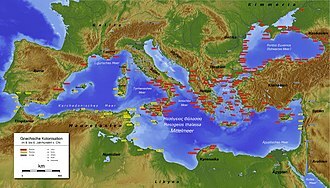 Around 1400 BC, the invading Achaeans destroyed Phaistos, as well as Knossos. The palace appears to have been unused thereafter, as evidence of the Mycenaean era have not been found. The Old Palace was built in the Protopalatial Period, then rebuilt twice due to extensive earthquake damage. 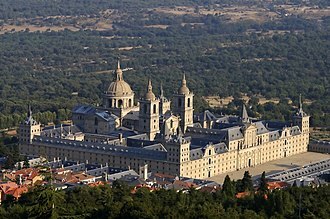 When the palace was destroyed by earthquakes, the re-builders constructed a New Palace atop the old. Several artifacts with Linear A inscriptions were excavated at this site. The name of the site also appears in partially deciphered Linear A texts, and is probably similar to Mycenaean 'PA-I-TO' as written in Linear B. Several kouloura structures (subsurface pits) have been found at Phaistos. 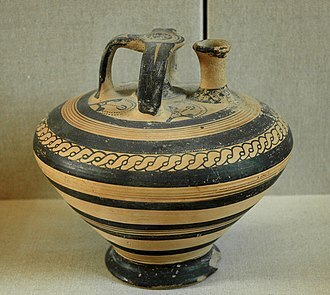 Pottery has been recovered at Phaistos from in the Middle and Late Minoan periods, including polychrome items and embossing in imitation of metal work. Bronze Age works from Phaistos include bridge spouted bowls, eggshell cups, tall jars and large pithoi. In one of the three hills of the area, remains of the middle neolithic age have been found, and a part of the palace which built during the Early Minoan period. Another two palaces seems to have been built at the Middle and Late Minoan Age. The older looks like the Minoan palace of Knossos, although this is smaller. On its ruins, which was destroyed by an earthquake around c. 18th century BC a palace of the later Minoan period was immediately built around 1700 BC, bigger and magnificent. This mansion consists from several rooms separated by columns. The levels of the theater area, in conjunction with two splendid staircases, gave a grand access to the main hall of the Propylaea with the high doors. A twin gate led directly to the central courtyard through a street with a large width. The splendour of the rooms interior owed to the investment of the floors and walls with plates of sand and white gypsum stone. To the upper floors of the west sector existed spacious ceremonies rooms, although their exact restoration was not possible. A brilliant entrance from the central courtyard was leading to the royal apartments in the north part of the palace, which they had view to the tops of Psiloritis, while for their construction had been used alabaster among other materials. For the princes particular rooms were used, smaller and less luxurious than the rooms of the royal departments. References to Phaistos in ancient Greek literature are quite frequent. Phaistos is first referenced by Homer as "well populated", and the Homeric epics indicate its participation in the Trojan war. The historian Diodorus Siculus indicates that Phaistos, together with Knossos and Kydonia, are the three towns that were founded by the king Minos on Crete. Instead, Pausanias and Stephanus of Byzantium supported in their texts that the founder of the city was Phaestos, son of Hercules or Ropalus. The city of Phaistos is associated with the mythical king of Crete Rhadamanthys. The new inhabitance began during the Geometric Age and continued to historical times (8th century BC onwards), up to the 3rd century, when the city was finally destroyed by neighboring Gortyn. Phaistos had its own currency and had created an alliance with other autonomous Cretan cities, and with the king of Pergamon Eumenes II. Around the end of the 3rd century BC, Phaestos was destroyed by the Gortynians and since then ceased to exist in the history of Crete. Scotia Aphrodite and goddess Leto, who was also called Phytia, were worshiped there. The people of Phaistos were distinguished for their funny adages. Phaistian in his descent was Epimenides who was the wise man who had been invited by the Athenians to clean the city from the Cylonian affair (Cyloneio agos) in the 6th century BC. ^ LaRosa, Vincenzo (November–December 1995). 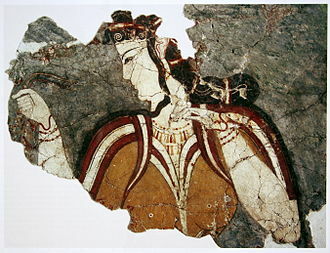 "A hypothesis on earthquakes and political power in Minoan Crete" (PDF). Annali di Geofisica. 38 (5–6): 883. The 1850 was proposed by Doro Levi, who did not agree with Evans on every point. ^ Spratt, T A B (1865). Travels and Researches in Crete. Volume I. London: John Van Voorst. p. 1. ^ Geography Book X, Chapter 4. ^ Spratt, T A B (1865). Travels and Researches in Crete. Volume II. London: John Van Voorst. pp. 23–25. ^ "The Linear B word pa-i-to". Palaeolexicon. Word study tool for ancient languages. ^ "Sights - Phaistos Palace - Hotel Sunshine Matala - ILIAKI in Matala Crete Greece!". matala-holidays.gr. Adams, E. (2007). "Approaching Monuments in the Prehistoric Built Environment: New Light on the Minoan Palaces." Oxford Journal Of Archaeology, 26(4), 359-394. Borgna, Elisabetta. (2004). "Social Meanings of Food and Drink Consumption at LM III Phaistos." In Food, Cuisine and Society in Prehistoric Greece. Edited by Paul Halstead and John C. Barrett. Oxford: Oxbow Books, 174-195. Driessen, Jan, and Florence Gaignerot-Driessen. (2015). Cretan Cities: Formation and Transformation. Aegis, 7. Louvain-La-Neuve: Presses universitaires de Louvain. Leitao, David D. (1995). The Perils of Leukippos. Initiatory Transvestism and Male Gender Ideology in the Ekdusia at Phaistos. Classical Antiquity 14:130–163. Levi, Doro. (1976–1981). Festòs e la civiltà minoica. 6 vols. Rome: Edizioni dell’Ateneo. Myers, J. Wilson, Eleanor Emlen Myers, and Gerald Cadogan, eds. (1992). The Aerial Atlas of Ancient Crete. Berkeley: Univ. of California Press; London: Thames and Hudson. Shaw, Joseph W. (2015). Elite Minoan Architecture: Its Development at Knossos, Phaistos, and Malia. Prehistory monographs, 49. Philadelphia: INSTAP Academic Press. Shelmerdine, Cynthia W., ed. (2008). The Cambridge Companion to the Aegean Bronze Age. Cambridge, UK: Cambridge Univ. Press. Vansteenhuyse, Klaas. (2011). "Centralisation and the Political Institution of Late Minoan IA Crete." In State Formation in Italy and Greece: Questioning the Neoevolutionist Paradigm. Edited by Nicola Terrenato and Donald C. Haggis. Oxford: Oxbow Books, 61-74. Watrous, L. Vance, Despoina Hadzi-Vallianou, and Harriet Blitzer. (2004). The Plain of Phaistos: Cycles of Social Complexity in the Mesara Region of Crete. Los Angeles: Cotsen Institute of Archaeology, Univ. of California. Wikimedia Commons has media related to Phaistos. Swindale, Ian. "Minoan Crete: Bronze Age Civilization: Phaistos page". Rutter, Jeremy B. "Aegean Prehistoric Archaeology". Dartmouth College; The Foundation of the Hellenic World. Archived from the original on 1 December 2011. Retrieved 5 May 2012. Phaistos, Visit. "Phaistos, South Crete: Individual holiday lettings and information about the area". Thomas Abel Brimage Spratt was an English vice-admiral and geologist. He was born at Woodway House, East Teignmouth and is the eldest surviving son of Commander James Spratt, RN and he joined the Royal Navy at age 16 in 1827 and was attached to the surveying branch on HMS Victory. He was engaged almost continuously until 1863 in surveying the Mediterranean while in command of the converted sixth-rate HMS Volage, as commander of the Spitfire he rendered distinguished service in the Black Sea during the Crimean War, and was appointed CB in 1855. At an earlier date he was associated with Edward Forbes, naturalist to the Beacon and he was specially indebted to Forbes for his interest in natural history and geology, and together they published Travels in Lycia, etc. He was elected a Fellow of the Royal Society as The author of Travels in Lycia and he published his research in 1856 and was congratulated for the clarity and practicality of his work by Isambard Kingdom Brunel, who was building the South Devon Railway at the time. A palace is a grand residence, especially a royal residence, or the home of a head of state or some other high-ranking dignitary, such as a bishop or archbishop. The word is derived from the Latin name Palātium, for Palatine Hill in Rome which housed the Imperial residences, in many parts of Europe, the term is applied to ambitious private mansions of the aristocracy. Many historic palaces are now put to uses such as parliaments, hotels. The word is sometimes used to describe a lavishly ornate building used for public entertainment or exhibitions. The word palace comes from Old French palais, from Latin Palātium, the original palaces on the Palatine Hill were the seat of the imperial power while the capitol on the Capitoline Hill was the religious nucleus of Rome. Long after the city grew to the seven hills the Palatine remained a residential area. Emperor Caesar Augustus lived there in a purposely modest house only set apart from his neighbours by the two trees planted to flank the front door as a sign of triumph granted by the Senate. His descendants, especially Nero, with his Golden House, enlarged the house, the word Palātium came to mean the residence of the emperor rather than the neighbourhood on top of the hill. Palace meaning government can be recognized in a remark of Paul the Deacon, AD790 and describing events of the 660s, When Grimuald set out for Beneventum, he entrusted his palace to Lupus. At the same time, Charlemagne was consciously reviving the Roman expression in his palace at Aachen, in the 9th century, the palace indicated the housing of the government too, and the constantly travelling Charlemagne built fourteen. In the Holy Roman Empire the powerful independent Electors came to be housed in palaces and this has been used as evidence that power was widely distributed in the Empire, as in more centralized monarchies, only the monarchs residence would be a palace. In modern times, the term has been applied by archaeologists and historians to large structures that housed combined ruler, court, in informal usage, a palace can be extended to a grand residence of any kind. Luigi Pernier was an Italian archaeologist and academic now best known for his discovery of the Disc of Phaistos. Pernier came from a wealthy family—his father Giuseppe was a landowner of French descent. He attended the Liceo Ginnasio Ennio Quirino Visconti before graduating in Letters at the University of Rome in 1897 and he specialised at the Scuola di Archeologia di Roma, gaining a diploma in 1901, after spending periods studying in Crete at the Missione Archeologica Italiana under Federico Halbherr. It was at time that Pernier was involved in the discovery of the Phaistos Disc. In 1904 he married Tonina Falchi, daughter of Isidoro Falchi, from 1909 he was the first director of the newly established Italian Archaeological School of Athens. In 1914 he was director of the Archaeological Museum of Florence. Pernier spent long periods abroad during this time, especially in the summer, on Crete, from 1928 to 1929, he completed the excavations on the palace at Phaistos before becoming director of the Italian Archaeological Mission on Halbherrs death in 1930. At Cyrene, from 1925 to 1936, Pernier carried out ten excavation campaigns as part of the Italian Archaeological Mission and these duties kept him on the move so much that he died abroad, on Rhodes, where he was leading a course organised by the Società Dante Alighieri. In summer 2008 Jerome Eisenberg, described by The Times as a specialist in faked ancient art, accused Pernier of having forged his best known find, a symposium was convoked to discuss the Disc in autumn 2008. Eisenberg argues that the disc can be dated by a thermoluminescence test, the authenticity of the Phaistos disc is supported by multiple discoveries made after the disc was excavated in 1908. A sealing found in 1955 shows the only known parallel to sign 21 of the Phaistos disc, at the symposium, Eisenbergs hypothesis was therefore dismissed. A proposito di alcuni lavori eseguiti recentemente nellinterno del Teatro di Marcello, Tipografia della Reale Accademia dei Lincei,1901 Commemorazione del socio Federico Halbherr fatta dal corrispondente. Giovanni Bardi tipografo della Reale Accademia Nazionale dei Lincei,1931 Di una citta ellenica arcaica scoperta a Creta dalla Missione italiana, Calzone,1909 Heliogabalus, M. Aurelius Antoninus. Roma, L. Pasqualucci,1911 Il disco di Phaestos con caratteri pittografici, dellUnione editrice,1909 Il palazzo minoico di Festos, Scavi e studi della missione archeologica italiana a creta dal 1900 al 1934. Gli strati piu antichi e il primo palazzo, dello Stato, Libreria,1935 Il palazzo minoico di Festos, scavi e studi della Missione archeologica italiana a Creta dal 1900 al 1934. Roma, Libreria dello Stato Il tempio e laltare di Apollo a Cirene, scavi e studi dal 1925 al 1934, Istituto italiano darti grafiche,1935 LOdeum dellAgorà di Gortina presso il Leteo. 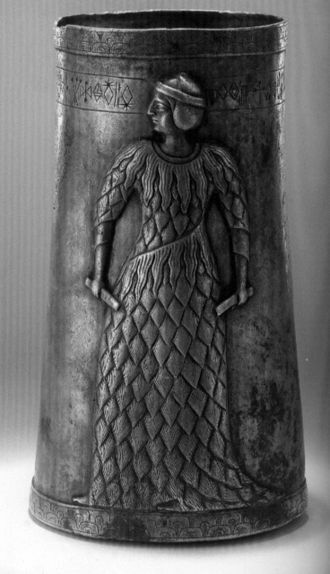 Bergamo, Istituto Italiano dArti Grafiche,1927 La raccolta archeologica Bargagli a Sarteano presso Chiusi, Stab. dArti grafiche S. Bernardino,1920 Lavori eseguiti a Festos dalla Missione Archeologica Italiana dal 15 febbraio al 28 giugno 1901, relazione. A kouloura, or kouloures is a circular subsurface pit with stone walls found in certain settlements within Ancient Crete, including Phaistos and Mallia. According on stratigraphy, the kouloura were all constructed around MM II, the name kouloura was coined by Arthur Evans during his expedition to Knossos in 1903. He named the pits after kouloura, the round Greek bread, the first four kouloura were discovered in 1903 at Knossos by Arthur Evans. Subsequently, Fernand Chapouthier discovered eight additional kouloura at Mallia, and these pits have always been found within the confines of major sites, including the West Court of Knossos and the Upper Court of Phaistos. Multiple theories have been put forward regarding the function of these kouloura in Ancient Minoan Society, there are only three majorly supported theories. Arthur Evans, the discoverer of the pits, theorized that they were garbage pits due to the lack of cement walling to prevent water seepage. 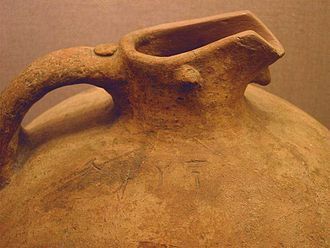 Chapouthier and Pernier believed that they were ancient cisterns, based on the presence of a long water trough in one of the kouloura at Knossos. 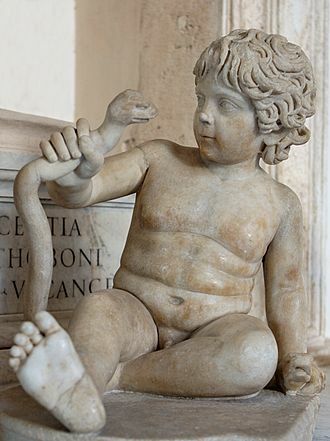 Heracles, born Alcaeus or Alcides, was a divine hero in Greek mythology, the son of Zeus and Alcmene, foster son of Amphitryon and great-grandson and half-brother of Perseus. 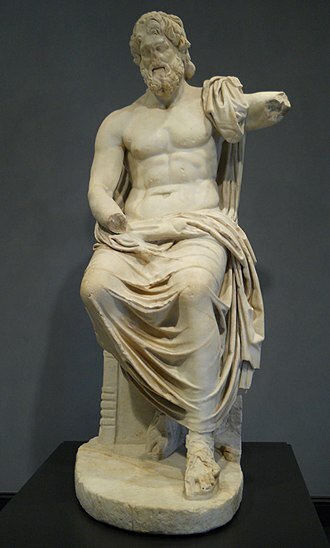 He was the greatest of the Greek heroes, a paragon of masculinity, the ancestor of clans who claimed to be Heracleidae. In Rome and the modern West, he is known as Hercules, with whom the Roman emperors, in particular Commodus and Maximian, often identified themselves. The Romans adopted the Greek version of his life and works essentially unchanged, details of his cult were adapted to Rome as well. Extraordinary strength, courage and sexual prowess with both males and females were among the characteristics commonly attributed to him, together with Hermes he was the patron and protector of gymnasia and palaestrae. His iconographic attributes are the skin and the club. These qualities did not prevent him from being regarded as a figure who used games to relax from his labors. By conquering dangerous archaic forces he is said to have made the safe for mankind. Many popular stories were told of his life, the most famous being The Twelve Labours of Heracles and his figure, which initially drew on Near Eastern motifs such as the lion-fight, was widely known. Heracles was the greatest of Hellenic chthonic heroes, but unlike other Greek heroes, the core of the story of Heracles has been identified by Walter Burkert as originating in Neolithic hunter culture and traditions of shamanistic crossings into the netherworld. 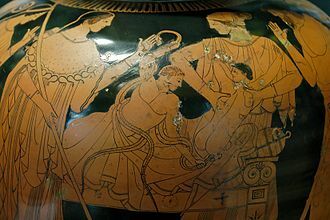 Heracles role as a hero, whose death could be a subject of mythic telling, was accepted into the Olympian Pantheon during Classical times. 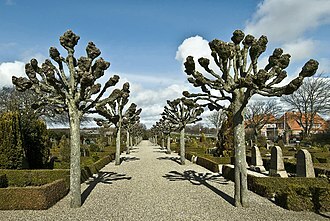 Around him cries of the dead rang out like cries of birds scattering left, in Christian circles a Euhemerist reading of the widespread Heracles cult was attributed to a historical figure who had been offered cult status after his death. The ancient Greeks celebrated the festival of the Heracleia, which commemorated the death of Heracles, what is believed to be an Egyptian Temple of Heracles in the Bahariya Oasis dates to 21 BCE. 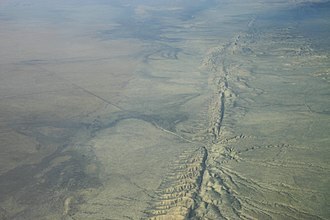 Sites may range from those with few or no remains visible above ground, to buildings and other structures still in use. Beyond this, the definition and geographical extent of a site can vary widely, depending on the period studied and it is almost invariably difficult to delimit a site. It is sometimes taken to indicate a settlement of some sort although the archaeologist must define the limits of human activity around the settlement, any episode of deposition such as a hoard or burial can form a site as well. Development-led archaeology undertaken as cultural resources management has the disadvantage of having its sites defined by the limits of the intended development, even in this case however, in describing and interpreting the site, the archaeologist will have to look outside the boundaries of the building site. According to Jess Beck in “How Do Archaeologists find sites. ”The areas with a number of artifacts are good targets for future excavation. The most common person to have found artifacts are farmers who are plowing their fields or just cleaning them up often find archaeological artifacts, many people who are out hiking and even pilots find artifacts they usually end up reporting them to archaeologist to do further investigation. When they find sites, they have to first record the area and if they have the money, there are many ways to find sites, one example can be through surveys. Surveys involve walking around analyzing the land looking for artifacts. ”This helps archaeologists in the future. In case there was no time, or money during the finding of the site, archaeologists can come back, archaeologist can sample randomly within a given area of land as another form of conducting surveys. Surveys are very useful, according to Jess Beck, “it can tell you where people were living at different points in the past. ”Geophysics is a branch of survey becoming more and more popular in archaeology, because it uses different types of instruments to investigate features below the ground surface. It is not as reliable, because although they can see what is under the surface of the ground it does not produce the best picture, Archaeologists have to still dig up the area in order to uncover the truth. There are two most common types of survey, which is, magnetometer and ground penetrating radar. In Greek mythology, Talos or Talon was a giant automaton made of bronze to protect Europa in Crete from pirates and invaders. He circled the islands three times daily. 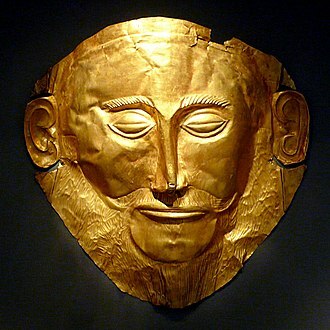 Alternatively Talos could be figured as a sacred bull, the conception that Hesiods men of the Age of Bronze were actually made of bronze is extended to men of the age of gold by Lucian for humorous effect. The pseudo-Platonic dialogue Minos rationalized the myth, thrice yearly showing at each village in turn the laws of Minos inscribed on brass tablets, according to Brian A. Sparkes, The most detailed treatment in literature is to be found in the Argonautica. However, we have detailed images of the episode,150 years earlier, Talos is said to have been made by Hephaestus at the request of Zeus, to protect Europa from people who would want to kidnap her. In some versions of the myth, Talos is forged by the inventor Daedalus, in the Cretan dialect, talôs was the equivalent of the Greek hêlios, the Sun, the lexicon of Hesychius of Alexandria notes simply Talos is the Sun. In Crete, Zeus was worshipped as Zeus Tallaios, Solar Zeus, the god was identified with the Tallaia, a spur of the Ida range in Crete. 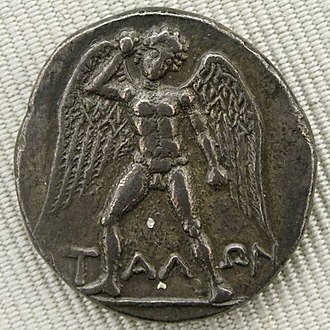 On the coin from Phaistos he is winged, in Greek vase-paintings, the ideas of Talos vary widely, with one consistent detail, in Greek imagery outside Crete, Talos is always being vanquished, he seems to have been an enigmatic figure to the Greeks themselves. Talos is described by Greeks in two versions, in one version, Talos is a gift from Hephaestus to Minos, forged with the aid of the Cyclopes in the form of a bull. In the other version, Talos is a gift from Zeus to Europa, or he may have been the son of Kres, the personification of Crete, in Argonautica Talos threw rocks at any approaching ship to protect his island. Talos had one vein, which went from his neck to his ankle, the Argo, transporting Jason and the Argonauts, approached Crete after obtaining the Golden Fleece. As guardian of the island, Talos kept the Argo at bay by hurling great boulders at it, peter Green, translator of Argonautica, notes that the story is somewhat reminiscent of the story regarding the heel of Achilles. Fragmentary boustrophedon inscription (code of law) in the agora of Gortyn. Inheritance regulations, fragment of the 11th column of the Law Code of Gortyn, Louvre. 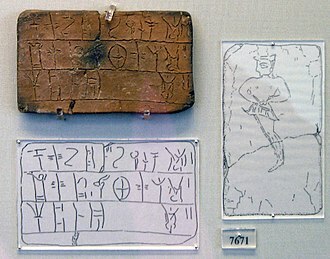 Linear A incised on tablets found in Akrotiri, Santorini. Linear A tablet, Chania Archaeological Museum. Linear A tablet from the palace of Zakros, Archeological Museum of Sitia. Linear A incised on a vase, also found in Akrotiri. An archaeological site with human presence dating from 4th century BC, Fillipovka, South Urals, Russia. 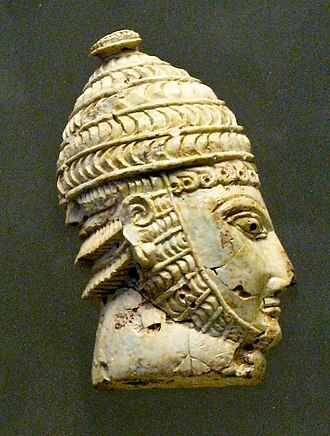 This site has been interpreted as a Sarmatian Kurgan. Tablet MY Oe 106 (obverse) exhibited at the Greek National Archaeological Museum. Bottom: tracing of the inscription (obverse). Right: Tracing of the reverse side depicting a male figure. Model of the "Palace of Minos" on Kephala at the Museum in Iraklio. Note the central courtyard, the columned porticos, the agglutinative architecture, the frequent light wells and the lack of defenses. Not shown are the extensive water supply and sanitation systems. Woodway Cottage in 1825, birthplace of Thomas Spratt.